Garrett Brann, who is about to turn 3 years old, has a form of epilepsy, known as “Dravet’s Syndrome,” which is robbing him of his childhood, a normal life, and much more. The disease manifests itself primarily in almost constant seizures. Garrett routinely has more than 100 seizures, of varying degrees of intensity, every day. Garrett’s story is obviously sad, but what makes it truly tragic is that there is a treatment which could very possibly end Garrett’s seizures and allow him to live a normal life. However, because that treatment is a derivative of marijuana, he is not allowed to have it. As a result of the frightening and damaging seizures, Garrett’s brain does not rest long enough to develop normally. He, like all children with the Syndrome, suffers from severe cognitive underdevelopment, which only gets worse with time. He used to be able to feed himself and speak, but has lost those abilities. He can no longer walk consistently and frequently falls. As a result, Garrett’s parents have had to rush him to the emergency room repeatedly for stitches and other medical treatment. Garrett cannot run, climb steps or jump like a normal 3-year old. He receives occupational, physical and speech therapy, but makes no real progress in any of these areas, as the Syndrome continues to run its often-fatal course. In an effort to ameliorate the seizures as much as possible, Garrett is currently on a highly toxic and addictive three-drug regimen. These drugs are known to cause liver damage. One of them is not covered by insurance, and costs the Brann family thousands of dollars per year. The treatment that could help Garrett is known as “Charlotte’s Web,” named after the first girl with the Syndrome to whom it helped. Charlotte, like Garrett, suffered with near constant seizures. Also like Garrett, nothing seemed to help her until she was given the marijuana-based oil. The results were miraculous. Her seizure rate went down from hundreds per week to less than one. She is now developing normally and has regained much of what she had lost when she was constantly seizing. Similar results have now been seen in dozens of children with the Syndrome. The miracle treatment is a tincture or oil that comes from a certain, specific strain of marijuana. The other active compound is known as cannabidiol, or “CBD,” which cannot make people “high” at all. 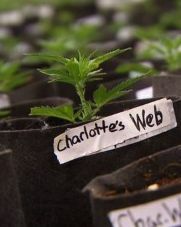 The specific strain of marijuana used to create Charlotte’s Web is packed with CBD and contains almost no THC. So the oil that could help Garrett cannot and will not get Garrett stoned or intoxicated in any way. If Charlotte’s Web came from a yucca plant or bacteria grown in a laboratory, it would be easily available in every CVS or Rite-Aid in America. But because it comes from marijuana, the plant that dare not speak its name, no child in Pennsylvania can obtain, possess or use it. Garrett’s parents can fly to Colorado, establish residency, buy the oil and bring it back to Pennsylvania, but if they do they risk arrest and felony prosecution. This policy is insane. A few drops of a simple oil can potentially save a young boy’s life. The oil is not addictive, not intoxicating, and has no side effects. This word has the same effect on many policymakers in Harrisburg and Washington, D.C. as Kryptonite has on Superman: it causes them to lose their ability to think clearly, and forces them to flee in terror. We must overcome this superstitious way of thinking. It is causing people to suffer needlessly, both with symptoms that could have been eased, and with the side effects of drugs much more toxic and dangerous than Charlotte’s Web could ever be. Would our policy on medical marijuana make sense to you if Garrett was your son?